dual 12db/oct switched capacitor multimode filter with mode selection and clock disruption. Bionic Lester is a dual multimode filter capable of many operational modes. 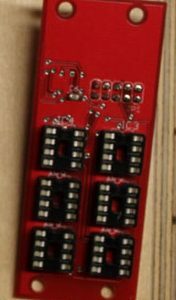 Each side has dedicated lowpass and bandpass outputs, and the third output for each side can be switched between highpass, allpass, or notch. The input amplifiers for each filter are scaled to allow some distortion. The character of this distortion changes with the mode setting. Bionic Lester has some normalled signal paths for convenient patching. The sum of the first channel’s manual cutoff control and CV input are normalled to the CV input for the second channel. This allows you to control both filter sections with a single hand (or CV), useful for dual-peak or allpass phasing applications. The audio input for the first channel is also normalled to the second to facilitate parallel filtering. The filter cutoffs are determined by dividing down a high-frequency clock generator. For the second channel, you can choose either the first or second channel’s generator as a clock source. 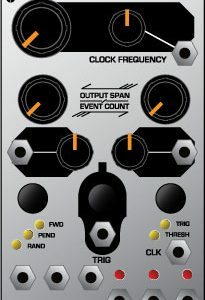 If you select both clock generators, absolutely horrifying audio garbage will result. A pushbutton control for selecting the desired amount of aliasing (minimum or maximum) applies to both sections. Resonance is voltage-controllable. Because Lester is a switched-capacitor filter, the user must be warned of some of its characteristics. 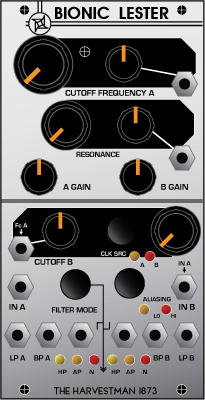 The aliasing, third output mode selection, and resonance settings are shared between both units. At lower cutoff frequencies, some aliasing may be present in the output signal depending on your resonance, aliasing, and mode settings, as well as the type of input signal. Bionic Lester does not self-oscillate using the onboard resonance control. An expander unit will be released soon. It is a 2×3 bipolar mixer (with mutes) that invisibly attaches to Bionic Lester for patchcord-free mixing of the six outputs, with dual VCA feedback paths back into the filter sections. 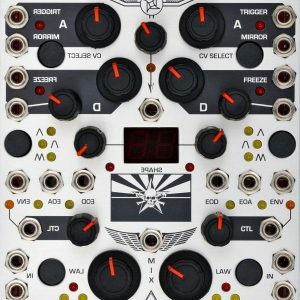 It also functions standalone as a performance mixer, with front-panel knobs and jacks that are also useful for injecting external signals and effects into the Lester core.